Maybe I am just weird but I tend to believe that others out there do not like mushy bananas either. You know, the ones that sit in the fruit basket forgotten like the proverbial step child until, without warning suddenly they turn brown, in a matter of hours it seems. Alright, admittedly I am exaggerating, but I just really do not like them even when they start getting the little brown spots. At least not for eating as a banana. No, at that point I will resort to using them up in all manners of ways that I came up with over the years (I don’t like to waste and throw them out after all) from smoothies to sweetener in baked goods and muffins, to ice cream topping, I have tried most anything. 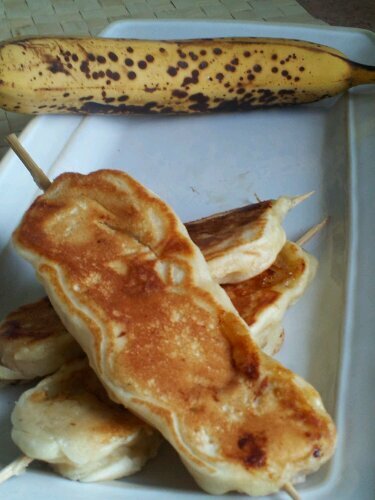 How about you guys, do you have any favorite banana-use recipes? 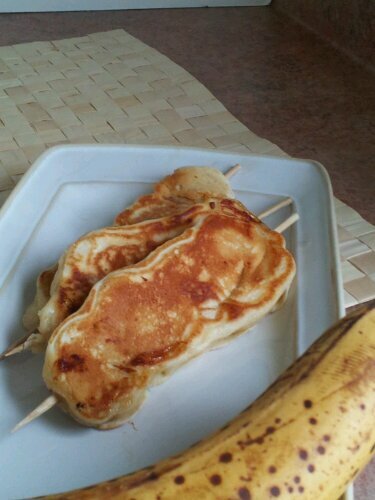 * one banana makes about three skewers on average. 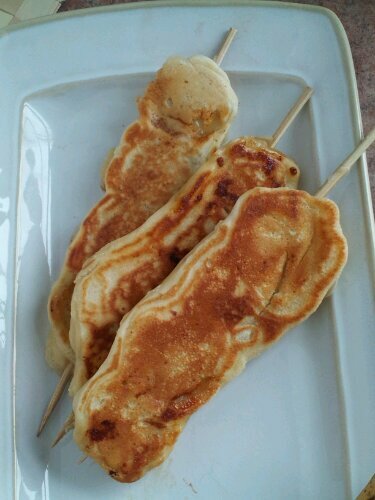 Put the pancake batter in a shallow dish and dip, first one side then the other, of the banana skewer until the slices are completely coated in batter. Cook in the preheated pan until set and slightly browned, then turn over and cook on the second side. 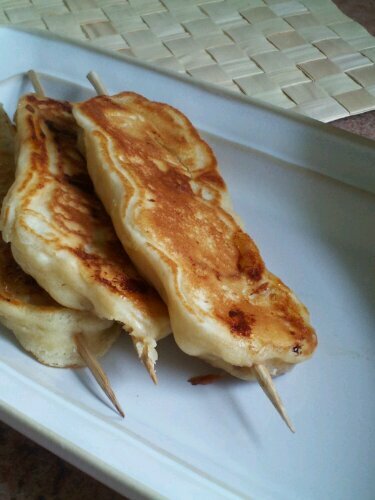 Depending on the size of your pan, you can cook 3 to 4 skewers at a time. Enjoy hot! Because of the skewer they are easy to pick up and eat!